I just wanted to share one of my customer's blogs with you. Her name is Meg and her blog is enderbynest. She's an independent artist and has her own line at enderbylove.com. Meg makes lots of cute recycled and reconstructed accessories. 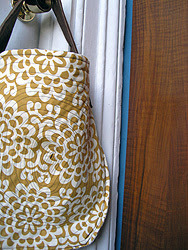 Her blog features lots of eco chic designs, even yours truly! Check out her huge feature of Salvage Life. Thanks for sharing. Enderby's website is really fun!